My mother-in-law, Mamaw (Dorothy Pogue), was a great cook. The entire family often gathered at her house on Sunday afternoons for dinner and dominoes. She had several recipes that were enjoyed by her family, but the Ranch Style Chicken Casserole recipe was a favorite of everyone. I have no idea where the recipe came from originally, or if she came up with it herself. My family loves it, and I was happy she shared it with me. 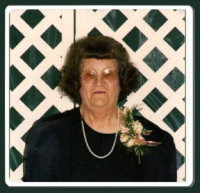 We lost Mamaw in April 2008. This recipe brings her back to our minds when we serve it. For this casserole, Mamaw would cook a full chicken and bone it. I don't often have the time to do that, so I sometimes use three cans of chunk white chicken instead. Mix soups, tomatoes, and chicken broth together. Layer tortilla pieces, chicken, onion, sauce, and cheese. Top with cheese. Bake at 450 degrees F for 35 to 40 minutes. Works great in the crockpot or slowcooker, too! Layer in a large crock pot as in the instructions above. Cook for 4 to 6 hours on low in the crockpot. Since I use canned chicken, and only the onion is uncooked before the casserole goes into the oven, the meal only takes about an hour from start to serving. Would you rather cook a recipe like this in the oven or in the crockpot? This cook and carry oval slow cooker is perfect to make this casserole in for those times you need to carry food with you to a covered dish dinner or pot luck dinner. The lock-on lid has a gasket that keeps the cooker leak proof during travel.